Chestnut Hill Classic Coming Up! 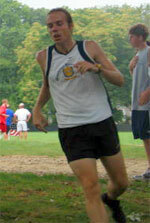 David Granger outlasted Greg Nash to win the 4th annual Chestnut Hill Cross Country Classic on September 17. David covered the three mile course in 15:54 with Greg just two seconds behind. David's time was only five seconds off the meet record set in 2003 by Peter Rook. Fifty four runners answered the starting gun at the race which is organized by the Wanderers. The weather was extremely humid making the running conditions very demanding. Mary Pat MacFarland was the top women's finisher in an excellent time of 22:03. The top Wanderers finisher was Matt Palombaro who grabbed fourth place in a time of 16:48. Matt was sandwiched between local cross country strongman Chuck Shields who finished third in 16:11 and defending champion Bob Rimkis, who continued his return from injuries with a strong 17:32 performance. Other notable performances were Terry Delph, who celebrated his 60th birthday with a 18:25 performance. He was nipped by Roxborough's Vincent Mundy. Local favorite Fred Kenney finished 14th in 19:14. 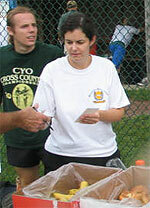 Doing their usual fabulous job on the sidelines were race directors Leslie Turchetti and Melanie Wright. A big thanks also to Chestnut Hill coach Paul Hines for helping to set up the event. The race over the Philadelphia Cricket Club course was held just prior to the high school invitational meet which was won by Roman Catholic High School. Tomato pie as well as bagels and bananas were served to the contestants and seemed to be favorably received.